The SaveToDB add-in may show web images in task panes. Just place photo URLs in table cells. 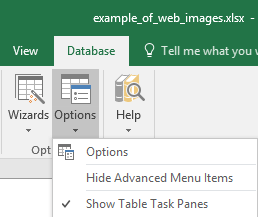 If you close the task pane, use Options, Show Table Task Pane to open it again. Also, you may place URLs into table cells and use the context menu to open links. You may use these features with any Excel table.